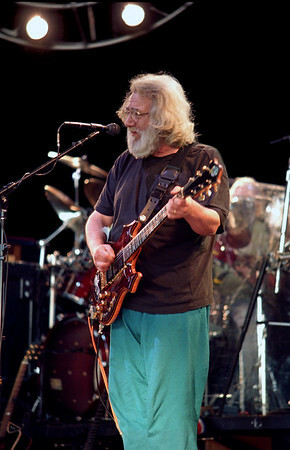 Grateful Dead at the Riverport Ampitheatre in St. Louis, MO on July 6, 1995. "...in our minds the St. Louis scene only added to heap of karma. With the riot & death threat on Jerry's life at Deer Creek, it was obvious the scene as we knew it was over. Things worsened when several fans were accidentally killed when a roof collapsed on them at a local campground. A moonless nightfall fell on that tour & we instinctively sensed the end was around the corner. Everything took a seriously dark & marring turn. Even the band sounded like a complete mess! They were totally out of the "zone" & had no juice. Beside all this, my friends & I proceeded to have one of the best road trips! The last stop of this tour was Chicago, which also ended up being the band's final shows of their career."